Dublin is a fantastic city to visit – you’re pretty much always guaranteed to have a good time when you visit the Irish capital! 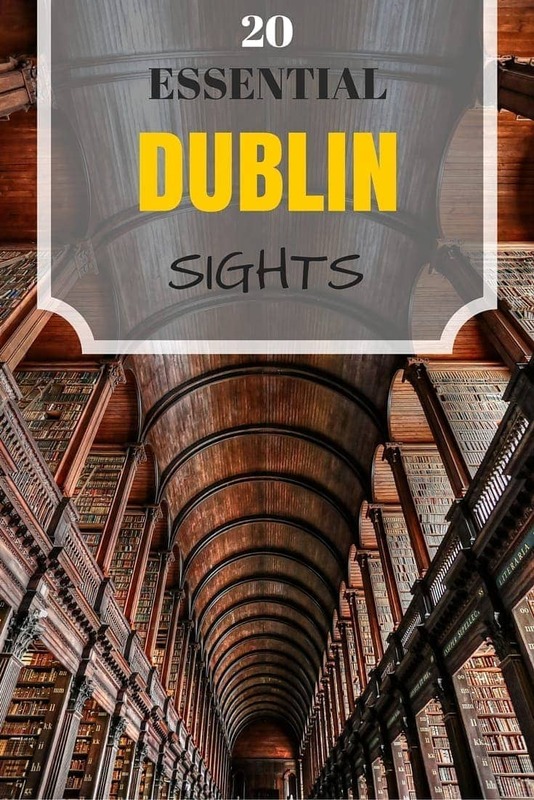 In our guide to things to do in Dublin, we’re going to share with you some of our favourite sights and activities in the city, to you give you some inspiration for your visit. 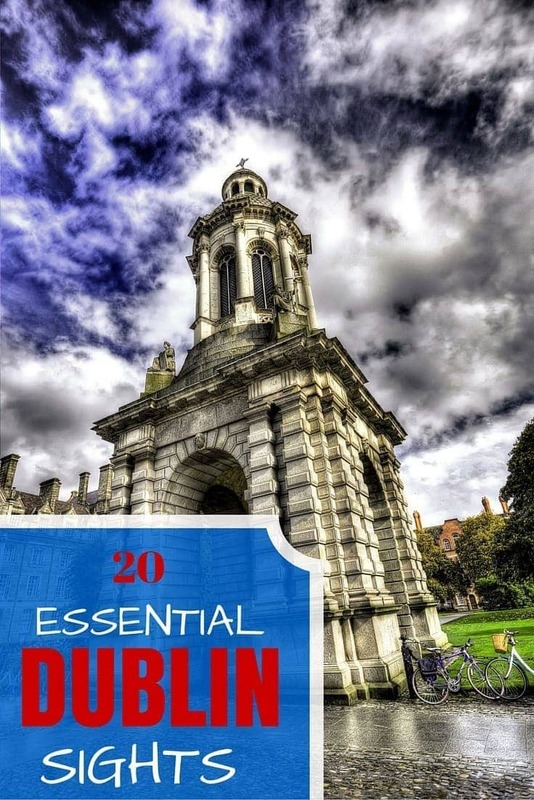 This post splits up Dublin’s attractions into some of the must-do sights that you’re likely going to want to prioritise on your visit, and then we cover a number of the other attractions that you might consider adding depending on how much time you have in Dublin, and your specific interests. Let’s get going! The Jeanie Johnston Tall Ship/Famine museum. Cover the must-do sights. You know, the ones that people make you feel guilty about for not having seen them. Yes, those. Let’s start with the Spectacular Spire of Shame. 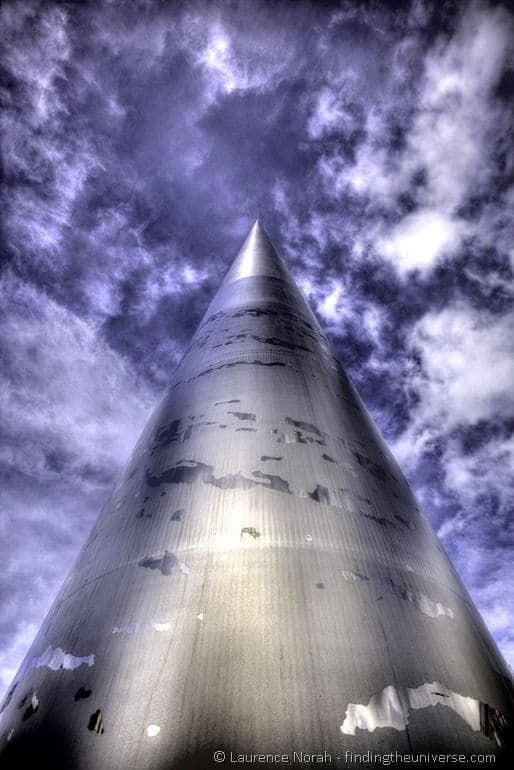 It’s not actually called the Spire of Shame, just the Spire, but I have not met anyone from Dublin who didn’t put the poor big shiny pole down. I don’t think it’s because it’s horrendous (I find it quite neat), but I think the amount of money spent on it might have been horrendous, and therefore the people of Dublin refuse to approve of it. If someone attempts to tell you all the names the Irish have given it, run away quickly, otherwise you might still sit there in three hours. I kid you not. 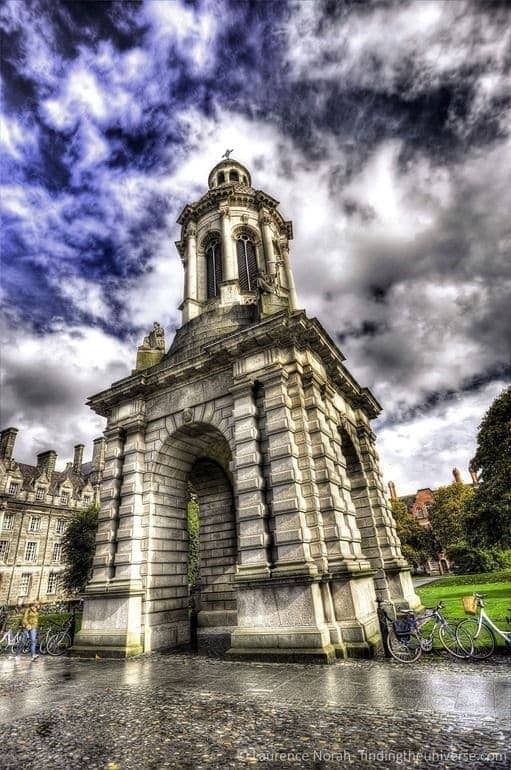 Conveniently, it’s centrally located, meaning you would have to make a tremendous effort to avoid it, so since you’re passing all the time anyway, just step through the gate and find yourself on the terrain of Ireland’s oldest university. Wander around on cobblestony grounds a bit, and you can tick that off the list, as well. Be aware: depending on your social environment, this might not be enough to convince them. They might go a step further, asking if you have seen the “Book of Kells” while you were there. The book of what? …Don’t worry about it now, it’s advanced stuff, to be covered below Step 3. Personally, I find you’re better off having your pint somewhere else which is a little less of a tourist trap, but there is no denying this area is very famous. It’s even more famous now because Loz and I had a beer there, too. We folded under the tourist pressure, but seriously: do check it out and get your appetite going by walking down the street, but feel no remorse to then go discover a nice (and cheaper) pub all by yourself somewhere else, you know: one that has more locals than tourists inside. 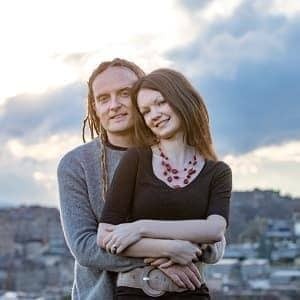 I feel funny saying that a brewery is a must-do, because many cities have breweries that you can visit, and they’re certainly all good fun, but not really for everyone. Well, we’re in Dublin now, and things are different: you cannot miss the Guinness Storehouse. Anybody in Dublin who you ask for recommendations will recommend it. Because in Ireland Guinness stands for much more than just another brand of beer. “My goodness, my Guinness” indeed! Yes, one of the dreaded history lessons in disguise, but I’d say you’d struggle to find one in an equally unique location. So unique in fact, that it was used for filming various movies, including “The Italian Job” (1969) and “In the Name of the Father” (1993). A tour is the only option to visit (try to come early), and the hour it takes goes by way too quickly. You won’t even have noticed all the information they poured into your little brain by the time you step outside again. Pure evil. 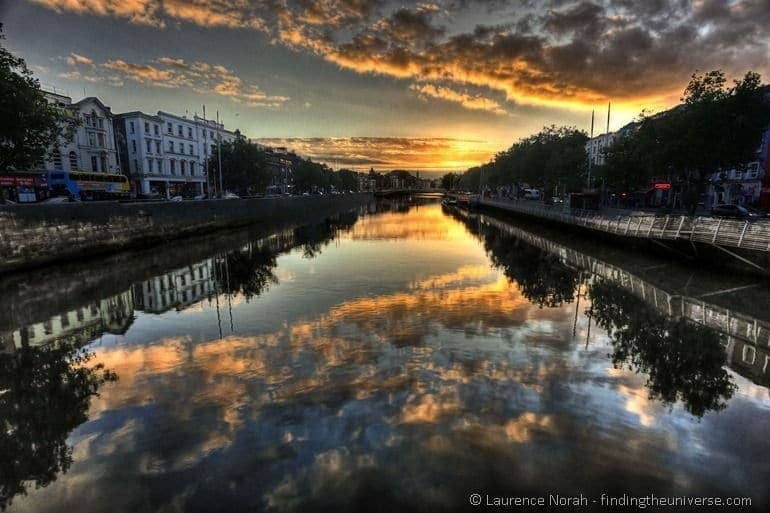 Now these were the most popular things to do in Dublin. I would like to say that if you want to avoid the crowds, avoid these, but that wouldn’t be accurate, because Dublin is not too big, yet very popular, so you will always have crowds. Apart from around the Spire, really. Around the Spire it’s all free space and open air. As we are moving away from the “must-do’s”, I will introduce some more sights that we went to. Note: these are not less important; in fact, you might find them more important/interesting/beneficial than the above, but I could not let you run into the bloody “What? You went there and you haven’t seen that?!”-trap. Of course I have now given anybody who wants to set up this trap the means to do so, come to think of it. Oh well, er, – where were we? Oh yes: more sights, in no particular order! Coming from a person who is neither very fond of beer nor of whiskey, my recommendations to visit breweries and distilleries should be taken seriously. Or maybe not? 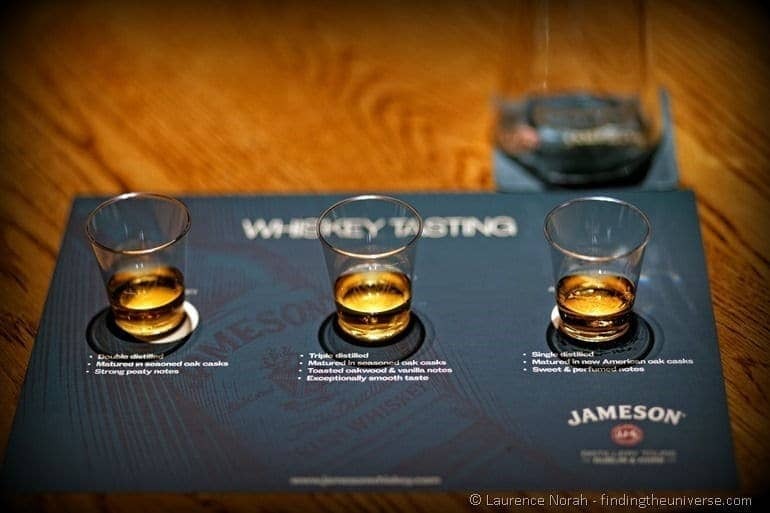 All I can say is that I thoroughly enjoyed the tour through the old distillery – it’s a much cosier affair than visiting the Guinness Brewery (experience both, if you can), and a congenial and entertaining one. History is not always pleasant, and Ireland had its fair share of the unpleasant bits. I mentioned the jail, but another interesting sight is this famine ship. 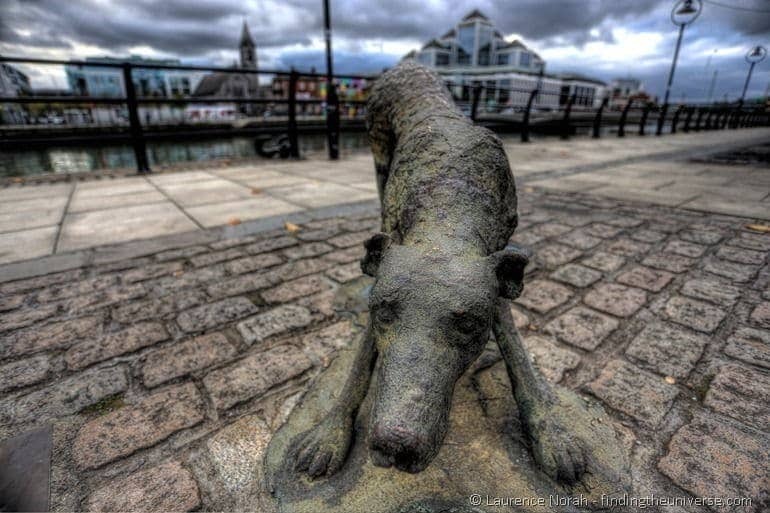 It’s not too far away from the Famine memorial which is another reminder of the Great Famine (1845-1852) that hit Ireland brutally, erasing around one million Irish, and forcing another million to leave the country if they didn’t want to share the same fate; mostly by boat. The tall ship, a replica, is not massive or jam-packed with memorabilia, but I think that’s the point of your visit: spending time in the belly of the boat to get a feeling what it was like for the passengers, whose stories you will hear about. We had a special experience, because a fellow visitor was an American with his daughter, who was on the trail of his great-grand-father, who had come to America as a young stowaway on a ship like the Jeanie Johnston. I don’t think it ever crossed that boy’s mind that one of his descendants would make the journey back to find out about him, and also that he had made the search very complicated by choosing an unrecorded way of travel. The older one of the two medieval cathedrals in Dublin (the second one being St. Patrick’s). There are a lot of interesting bits to discover, but my favourite part was the crypt which is massive (as far as crypts go – and it is in fact one of the largest medieval crypts in Europe) with a funky (!) crypt café (!! ); and apart from the regular crypty stuff like stone coffins, jewellery and books, it had costumes from the TV series “The Tudors”. All quite progressive for a nearly 1000-year-old cathedral, don’t you think? 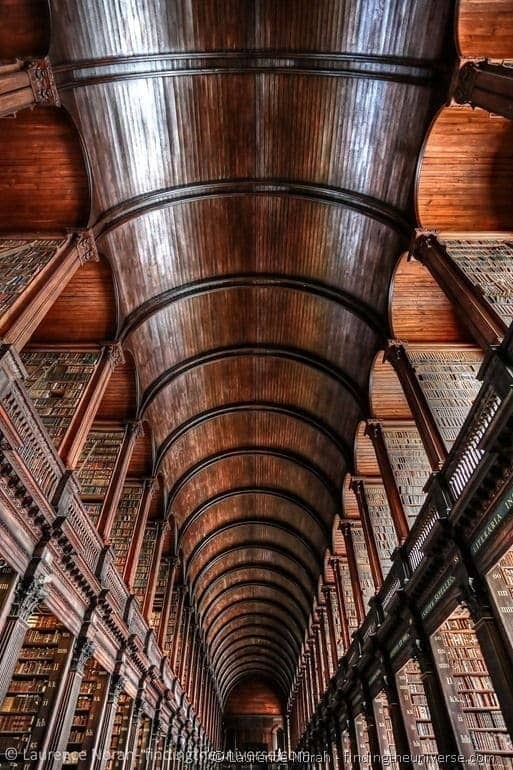 The Book of Kells and the Long Room are both found in the Trinity College Library. The Book of Kells, an illuminated manuscript from the 8th century, is considered a masterpiece of Western calligraphy and is probably the reason why most people come and visit – but since you can’t take pictures (imagine the sad expression on our travel blogger faces), we spent much more time in the stunning Long Room. We are shallow like that. I went to Dublinia and the National Wax Museum. Dublinia is a “living history” museum and has three different exhibitions, dealing with the Vikings in Dublin, medieval Dublin and how to uncover history through archaeology. It’s very worthwhile, just know that it is for all ages to enjoy and often interactive. When I told Laurence that I had been to the National Wax Museum, he frowned a bit, as in, “Oh, how interesting can that be”, and I hadn’t expected it either, but I had so much fun there! They have it all: historical figures and scenes, mythological scenes, a science section, politicians, Irish celebrities, international celebrities and Chambers of Horrors that almost gave me a freaking heart attack! 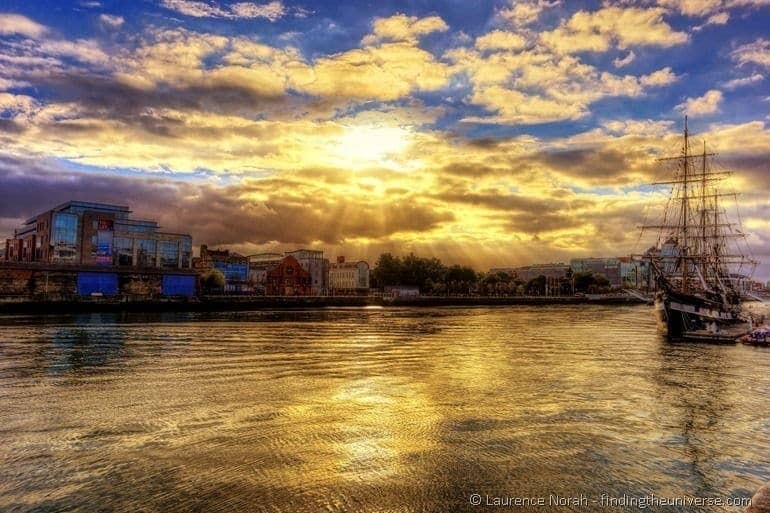 Realize that you probably need and want to move to Dublin for a while in order to see and experience it all. Bummer. I had many more museums on my list, and while I can only expect them to be awesome, instead of vouching for it, I just want to name a few in order to give you an impression what’s out there. 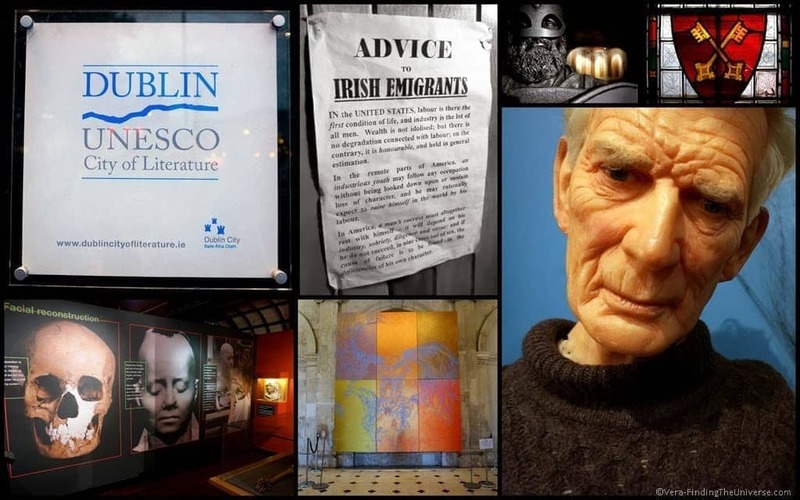 Two quirky-sounding museums caught my eye whilst doing research: The Little Museum of Dublin, which must be full of all kinds of stuff, is very popular and best seen via one of the tours which run every hour. Shame, shame, shame: I didn’t make it to either Dublin Writers Museum, nor the James Joyce Centre. I did learn that you can do a Literary Pub Crawl, though. An offer that stands very much for practical thinking. The Chester Beatty Library. Weirdly enough any description of it doesn’t sound too interesting to me, but Lonely Planet must have a reason to declare it “not just the best museum in Ireland, but one of the best in Europe”. The Dublin City Gallery. My sister visited and recommended it to me. It MUST be good. Other travellers raved about the Modern Art Galleries (yes, there’s two! ), and let’s not forget the National Gallery. Last but not least I had wanted to visit the Leprechaun Museum, for the obvious reason being that it’s a Leprechaun Museum, of course, but alas, it was another thing I couldn’t make it to. All I have heard is that it’s good, but no details. Very mysterious. Vow to come back. I had not expected Dublin to be so full of stuff to do, and at the same time to skilfully distract me from doing it by being such a great, lively place, where I am always willing to stop and watch all the things happening around me. It’s hard to do that justice, and my attempt here still misses many faces of the city, like the beautiful little park St Stephen’s Green, or all the different bridges over the river Liffey, or Grafton Street, where musicians and artists take the term ‘busking’ to a whole different level, or all the theatre/comedy/dance/music shows, and of course also the Irish themselves, being so very hospitable in a very down-to-earth, genuine way. Getting around by foot is fine. Only exceptions: the Guinness Storehouse and the Old Jameson Distillery make for a bit of a longer walk, and the jail even more so. Luckily the Dublin Pass includes the Hop on Hop Off bus tour, so to get to the jail we made good use of them, and it also gave us the opportunity to get a city tour, as they have different kinds of busses which you can all use, and which either come with a live commentary, or a recorded one, or –gasp- like a regular bus. Another reason to pick up the Dublin Pass! We used Dublin Passes, so we had free entry to all the attractions I mentioned we visited, apart the Trinity College Library (Book of Kells, Long Room). 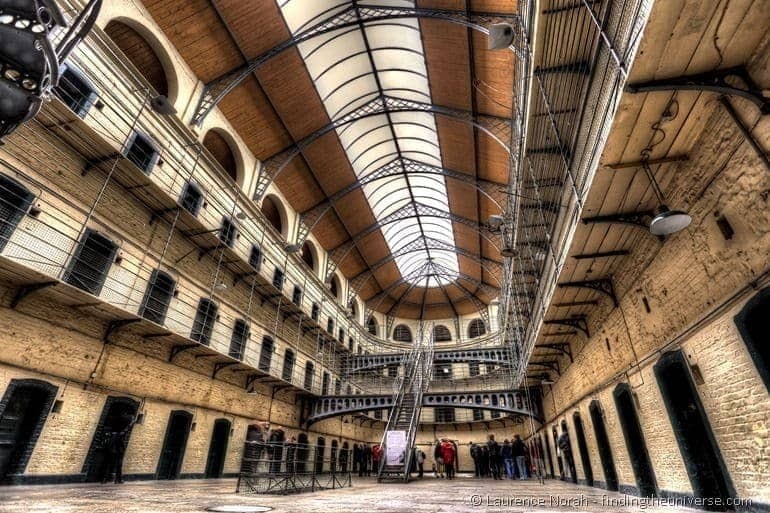 The Dublin Pass offers free entry to over 30 sights and a lot of deals and discounts. You can even visit the same attraction twice (just not on the same day). I am a big fan of these city passes, and the Dublin Pass is no exception. You can see our full review of the Dublin Pass here. We stayed in Dublin courtesy of the Maldron Hotel at Parnell Square, which we found to be in the perfect location, just a five minute foot walk away from the centre, yet far enough away from it for some peace and quiet whenever we spend time at the hotel. Tip: when you stay there, try out their menu too! 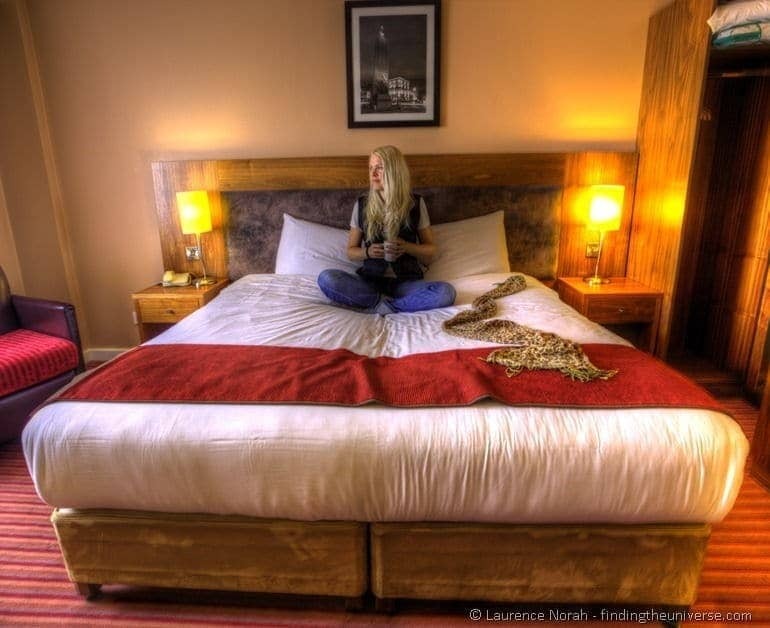 There are plenty of accommodation options in Dublin though, across a wide range of budgets, and we don’t think you’ll have any problem finding somewhere to stay. Check out the Dublin listings on Booking.com to get you started. And that sums up our Dublin adventure and guide for things to do in Dublin for your trip. If you’ve got anything to add, let us know in the comments below!